How well do British Columbia wines age? That is one of the questions most frequently asked of those of us who taste BC wines often. But for the most part, we are tasting newly released wines rather than wines that have had long-term cellaring – and not always wines from a leading producer. Recently, however, the owners of Burrowing Owl Estate Winery – Jim and Midge Wyse and their son Chris (photo, opening wines) – invited me to a tasting of all the Chardonnays and all the Syrahs that winery has made. The results were instructive. The tasting also included winemaker Scott Stefishen. Born in North Vancouver in 1979, he earned his winemaking degree in Australia and did several vintages in the Margaret River before returning to Canada last year. He worked with Road 13 winemaker Michael Bartier for the 2008 crush. When he was still in Australia, which has had serious forest fires near vineyards in recent years, Scott did a study of smoke taint in wines. That expertise was reflected during the Burrowing Owl tasting. Burrowing Owl made its first wines in 1997 and has been at the forefront of quality producers every since. A Vancouver wine agent (who represents other Okanagan wineries) says enviously that Burrowing Owl operates “under a halo” in terms of its reputation with consumers. The reputation was built on a combination of good grape growing and good winemaking. The winemaker from the beginning through the 2004 vintage was consultant Bill Dyer, a talented and experienced California vintner. Steve Wyse, who was his cellar hand and assistant, took over when Bill left. Steve left after the 2006 vintage (he is now launching his own Black Sheep Winery at Osoyoos). Australian-trained Jeff Del Nin did the next two vintages before leaving to join Church & State. Scott joined Burrowing Owl earlier this summer. Even with all of those winemaker changes, the guiding style at Burrowing Owl is that established by Bill Dyer. The white wines are elegant and the oak never gets in the way of the fruit. The reds are big and ripe, reflecting the way that vineyard matures the grapes. If anything, Burrowing Owl reds in the future might even be more ripe. On a small block of Cabernet Franc, the winery is testing the use of a white fabric strung along the base of the vines to reflect more sunlight into the north side of the rows. See the above photograph. Here are notes and reflections from the vertical tasting. Chardonnay 1997: Gold in colour with aromas and flavours of crème brulé. The acidity has softened, leaving the wine flat. The wine is well past its prime. Chardonnay 1998: Gold. A hot vintage wine still being held together by its alcohol and minerals. The aroma recalls creamed corn. Drink it up now. Chardonnay 1999: Gold. Cool vintage wine with enough acidity to give an austere finish to its citrus and mineral flavours. Drink now. Chardonnay 2000: Gold. There is a core of lively, sweet fruit (tangerines, ripe pineapples). Drink within a year. Chardonnay 2001: Light gold. Toast and citrus aromas. Bright citrus flavours. Still nicely alive but best within a year. Chardonnay 2002: Light gold. Toasty aroma (from the barrels). Rich texture, with attractive citrus flavours. Drink within two years. Chardonnay 2003: Dark gold. Seriously maderized and tasting like a dry sherry. This was the first year that synthetic stoppers were used rather than cork. Chardonnay 2004: Fairly dark in colour. The wine is in the early stages of turning itself into sherry. These wines show how unsatisfactory synthetic stoppers can be for wines when aged more than two or three years. Chardonnay 2005: Synthetic stopper but the wine is still drinking well, with rich flavours of citrus and toast and with slightly more prominent oak. But for the stopper, this could be aged further. Chardonnay 2006: The wine is fresh and lively. Age it another year. Chardonnay 2007: Back to a cork closure for this classically elegant Chardonnay, showing good minerality, lively citrus flavours and good length. Drink this over the next five years. Syrah 2000: The debut vintage. Even though made with fruit from young vines, it is in excellent shape, with aromas of fruit, spice and liquorice, flavours of spicy plum and mocha, and a soft, chewy texture. Based on this wine, one would think that Burrowing Owl reds have at least 10 years of pleasurable life. Syrah 2001: Another generous red, with aromas and flavours of spiced plum, black cherries and liquorice. Syrah 2002: Dark in colour and firm in texture for Syrah (a good portent for aging), this shows earthy flavours of prunes, coffee and black chocolate. Syrah 2003: This was the year of the forest fires in the Okanagan. Winemaker Scott Stefishen picked up a hint of wood smoke (“medicinal” he said) in the aroma of this wine. The rest of us described it as elevated pepper aromas. It is a big ripe wine, with liquorice, coffee and prune flavours again. The minimal smoke note has never been an issue with this wine, which has won serious awards. Syrah 2004: This vintage stands out as the leanest of Burrowing Owl Syrahs. Perhaps the synthetic closure is causing mischief again. Drink it up. Syrah 2005: This is drinking very well now, with generous flavours of black cherry, spice and chocolate. A very harmonious wine. Given the closure, enjoy this superb wine over the next year. Syrah 2006: Classic peppery Syrah aroma; the wine has sweet berry aromas and flavours. Firm and full-bodied, it deserves aging. Happily, the winery returned to a cork closure. Syrah 2007: This is as satisfying a Syrah as any in this line-up – bold and meaty, with aromas of pepper and deli meats and flavours of plum and chocolate. Take your time. Now beginning his ninth vintage as winemaker at CedarCreek Estate Winery, Tom DiBello has established himself as one of the best Canadian winemaker imports from California. He is a graduate of the University of California at Davis. He started his winemaking career with Warren Winiarski's legendary Stag's Leap Wine Cellars in the Napa Valley. 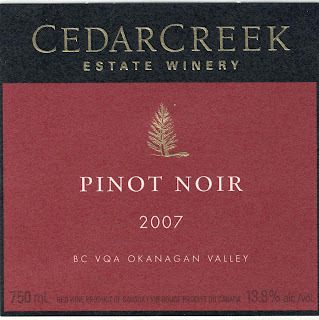 Then he headed off to make wine in Australia, Arizona and Washington before settling down, or so it seems, with CedarCreek in the Okanagan in 2000. One of Tom's strengths is his excellent attention to detail. Ross Fitzpatrick, the former senator who owns CedarCreek, once told me that Tom is "a worrier" about his wines - a positive thing in winemaking where nasty surprises happen when a cellar is not managed carefully. The detail-oriented winemaking at CedarCreek expresses itself in wines of superb quality, right across the winery's portfolio. 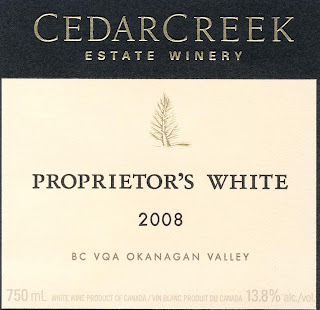 The current releases include the 2008 Proprietor's White, selling for only $12.90. This is the wine for fans of the overpriced Conundrum from California. Like that wine, this is a complex blend: 40% Chardonnay, 18% Pinot Gris, 13% Riesling, 12% Gewurztraminer, 11% Pinot Blanc and 6% Ehrenfelser. It is a juicy, aromatic blend tasting of pears and citrus with a hint of sweetness on the finish. A bargain! 87 points. The winery has released 3,313 cases. Recently, I also tasted some of the other new or recent releases with Tom, including wines from CedarCreek's Platinum (or Reserve) tier. These are more expensive because they are made fruit from low-yield vines and because they are aged in the most costly new French oak barrels in Tom's cellar. Ross Hackworth (above) had been drinking the wines from Nichol Vineyard & Estate Winery for a number of years before he bought the winery four years ago from founders Alex and Kathleen Nichol. The most recent releases from Nichol indicate that Ross has not deviated from the fundamental Nichol style although, arguably, the wines have an added degree of refinement. As well, Ross has dropped some of the niche wines that Alex used to make while adding a quite interesting Gewurztraminer to the portfolio. The Nichols opened the winery in 1993 after converting a former Naramata orchard into a vineyard. They planted the first Syrah in the Okanagan. The legendary Syrahs that Alex made undoubtedly inspired others to plant what has become one of the Okanagan's important red varieties. By coincidence, Ross grew up on a Naramata orchard that his parents bought in 1973. As the Nichols were planting their vineyard, Ross, who was trained for business, began a sales executive in Vancouver with a major pulp and paper company. He liked the career but eventually tired to travelling two to three weeks each month. In 1999, Ross spent weekends helping a friend restore the heritage hotel in Naramata. In the process, he reconnected with his roots and bought a home in Naramata. He had just begun looking for his own vineyard when he learned that the Nichols were getting ready to retire. The purchase agreement provided for Alex to mentor Ross for a vintage or two. Ross was an apt student, for the quality of Nichol wines has not missed a beat. The one visible change at Nichol under the new owner was a major expansion of the winery in 2007. Frugal and tight for funds, Alex laboured in cramped quarters to make between 700 cases and 1,200 cases each year. Ross is targetting an annual production of 3,500 but he built a winery big enough to make 10,000 cases a year. The reason? He figured out that it is easier to make good wine if the working space is efficient and comfortable. Gewurztraminer joined the portfolio after he contracted grapes from a neighbouring vineyard that happened to have that variety. Lovers of this wine will welcome this addition to the Nichol selection. The wineries in the Similkameen Valley have begun to make a strong and credible effort to define a terroir-based personality, setting their wines apart from those of the much larger Okanagan Valley. Currently, there are 12 wineries in the Similkameen, eight of which are members of the recently-formed Similkameen Wineries Association. Many of those wineries are only a few years old, one reason why the Similkameen remains a wine-touring footnote. The Similkameen Wineries Association’s efforts are critical in raising the region’s profile so that the Similkameen, like the Naramata Bench, achieves a front-of-mind position among wine tourists and consumers. Are Similkameen wines different? The winemakers there, like George Hanson, the co-owner of Seven Stones Winery, think so. He is pictured above with a jar of dirt from his vineyard, illustrating just how complex the soils of the Similkameen are. The layer of white in the middle of his sample appears to be the calcium which accounts for the exceptional quality of his Pinot Noir grapes. The Similkameen has the same problem as the Lodi grape-growing region has in California. Most of the Lodi’s grapes, notably its old-vines Zinfandel, find their way into wines made in Napa or Sonoma. Until recently, Lodi was one of the most unheralded vineyard regions in California. The producers there are working hard on establishing a profile of their own. The Similkameen Valley has about 600 acres of vineyard. The Okanagan has more than 10 times that acreage and more than 100 wineries. Many of those wineries buy Similkameen grapes. Two of the largest vineyard owners in the Similkameen are Peller Estates and Mt. Boucherie. It is rare to see a Similkameen-designated wine from either producer. 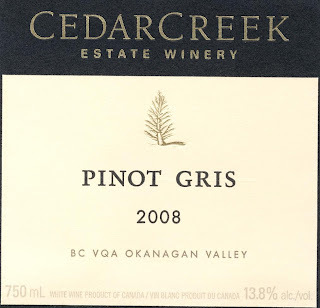 The grapes are blended with fruit from the Okanagan. That means that the resulting wines will have the Wine of British Columbia appellation. There is nothing wrong with blending grapes from several appellations, as the delicious wines from Peller and Mt. Boucherie demonstrate. Indeed, several of the Similkameen wineries also buy Okanagan grapes as they wait for their own young plantings to mature. John Weber of Orofino Vineyards, for example, has gradually been establishing enough sources of grapes in the Similkameen for his needs. He also has been buying some Okanagan grapes for at least one of his reds. In an early vintage, that wine had the Okanagan appellation on it. That led to so many questions from consumers in his tasting room that he now used the broader British Columbia appellation for the wine. Similkameen wines should be different because the growing conditions in this valley differ from those of the Okanagan. Perhaps the most singular feature of the Similkameen is the wind that rises each afternoon and is often quite strong by evening, blowing from north to south. This is a big reason why the vineyards and orchards are so disease-free that close to half of all farms are organic. Vineyards are planted both of the benches along the east and north sides of the valley and on the valley floor. The sun-baked benchlands produce big reds while the valley floors support both red and white varieties. The Similkameen Wineries Association hosted a recent trade tasting in Vancouver and is sponsoring a big consumer tasting at The Grist Mill near Keremeos on the afternoon of Sunday, September 12. From the Vancouver tasting, here are some recommendations, beginning with six quite good Chardonnays, a white variety that might be a signature variety for the Similkameen. Cerelia is a winery at Cawston that opened in late July. Cerelia apparently is what the Romans called their harvest festival, which explains the Roman numerals on the label. Here are notes on other excellent Similkameen Pinot Noirs. And others well worth seeking out. Two of the wineries in the Similkameen valley make fruit wines. Forbidden Fruit Pomme Desirée Iced Apple ($28.90 for a half bottle) is the fruit wine industry’s answer to icewine. This spicy wine is well-balanced, with a clean, refreshing and lingering finish. 90. A similar dessert wine is Rustic Roots Iced Orin ($27.90 for a half bottle), a delicious and well-balanced sweet wine made from organically-grown Orin apples. 90.